Norway's retro psychedelic warlords, Tangle Edge, mine their own distant halcyon past with this fiery double CD originally recorded in 1982-83. Still in their infancy at the time, Dropouts documents the group's volcanic birth pangs as they bravely experiment-though sometimes ill-advisedly-with a potpourri of styles ranging from heavy cosmic rock, to jamming improvisational freakouts, to moments of folksy psychedelia and angular, guitar-dominated progressive fusion ala King Crimson. Hence, there's much youthful energy and vigor on the 23 tracks that make up Dropouts; but, as with youthful exuberance, there's also excess and needless repetition-neither of which however diminish the pure enjoyment of hearing a group achieving a kind of synergistic bliss within the scope of its limitations. Had Hawkwind been Norwegian their debut album might've sounded something like Dropouts. In fact, the primitive electronics (ring modulator and sundry effects devices but no synthesizers), heavily distorted feedback-drenched guitar, and overdriven bass give Tangle Edge, at least in this early incarnation, the sound of the Hawkwind Spacecraft streamlined to a power trio circa 1971-72. Consisting of Ronald Nygard (guitar, e-bow, percussion), Hasse Horrigmoe (bass, penny whistle, bells), and Tom Steinberg (drums, percussion, ring modulator, electronics), this embryonic version of Tangle Edge explores the primal energies of the Id in much the same way as the early Amon Düül II or Guru Guru-often with explosive results. The brief electronic intro "Space Party"-a pastiche of rumbling oscillations-opens the flood gates for such experimental psychedelia as "Slow Essence," where Nygard's esoteric guitar inventions move serpentine-like through a sea of modulated electronic blips and bloops, and "The Game Watcher," a disarming collage of anarchic percussion, bursts of white noise and treated guitar that reminds one of Faust at their most abrasive. On the other hand, tracks like "Resistance…Resonance," "No Doubt" and "Creeping Midnight" recall the proto-prog metal of Red-era Crimson: angry guitars flail away against driving bass and crashing drums, creating an aural landscape of menace and wild abandon. More reflective pieces like "Floating Arts, Crawling Flutes" and "Deep Swimming Hog" use unconventional combinations of sound sources (penny whistle, bells and electronics) to create folk-inspired vignettes with touches of oriental psychedelia and surrealism. 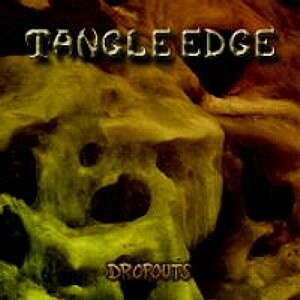 At their most daring, though, Tangle Edge explores the nether regions of prog fusion, at times resembling the Floyd during their primeval space rock phase (A Saucerful of Secrets and Ummagumma) and Crimson at their defiantly anarchic peak (Larks Tongues' in Aspic and Starless and Bible Black). Both "Banana Raincoat in the Chickenshack" and the 17-minute "Subjective Evaluation" roil with edgy Frippian guitar passages underscored by thick, droning bass and stochastic, unrestrained percussion. Bristling with the energy of a live improvisation, the latter piece moves from a relatively calm opening section to a blazing climax of tortured feedback, electronically altered drums and oscillating white noise effects. It's this determined spirit of adventurism that makes Dropouts a thoroughly engaging listen, and if at this nascent period of the group's development their flaws are not entirely tamed, the group's vision for their future musical direction is clear.